The door of one such shop in Seattle says it was "inspired by Starbucks"
Company executive: Stores are "learning environments for us to be innovative"
Seattle, Washington (CNN) -- There are over 15,000 Starbucks in the world but none like the one at 328 15th Avenue East in Seattle. 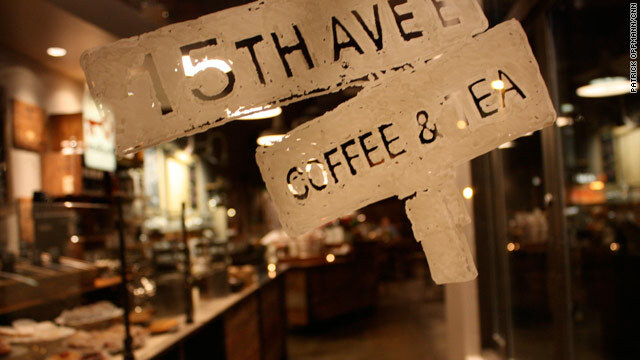 Officially the coffee shop is called "15th Ave Coffee and Tea" but the store and a similar sister location have earned another name: "the Stealth Starbucks." At first glance the coffee shops in the mega-chain's hometown of Seattle do not even look like Starbucks. The ubiquitous smiling Mermaid logo has apparently swum away, there are no baristas in trademark green smocks either and not a tall, grande or venti sized beverage in sight. Inside, pages from Plato's dialogues decorate an entire wall, sweeteners sit on a bathtub converted into a table, beer and wine are for sale and employees dole out customized drip coffees along with advice on which are the best beans. At every turn, the message seems to be here "it's about the coffee." After first checking that her Starbucks rewards card would actually work at the location, customer Donna Godfrey said she liked the store precisely because it didn't seem like -- well -- such a Starbucks. "I really liked the ambience, its not as loud as most of your Starbucks. It just feels more European," Godfrey said. "You get to the point where you walk down the street and on every corner or on every other corner there's a Starbucks. So I think this is a way to have a presence without it being that thumb in your face presence." If customers enjoy the "stealth" Starbucks experience without linking it immediately to the coffee giant that's fine with the creators of the concept, said Arthur Rubinfeld, Starbucks' president of global development. "These are learning environments for us to be innovative and push the envelope, Starbucks customers worldwide have come to expect a certain amount of offerings and timing in our stores we wanted to change things up here but didn't want to disappoint any of our customers," Rubinfeld. According to Arthur Rubinfeld the "stealth" stores are not a departure from the brand but an effort to get back to the basics of the successful product that launched the company from a small single location coffee shop to a worldwide phenomenon. "It's rooted at the very core of Starbucks, we are an innovative company," Rubinfeld said. "We most continue to be that, and stay relevant as we continue to move forward and grow." Rubinfeld said Starbucks is closely watching the ideas that come out of the new stores and may eventually adopt some of those innovations company-wide. Seattle-based blogger Melody Overton writes about all things Starbucks on her Web site Starbucks Melody and says the new stores are an attempt by the chain to go back to "the early '90s where you went into the stores and Starbucks was about the coffee. You smelled the smell of coffee in the stores, there wasn't the sound of blenders going every two seconds." But small coffee shop owner Sebastian Simsch says it's getting the small details right that's tricky, especially for a company like Starbucks that thinks on a global scale. At the one location of his store Seattle Coffee Works, Simsch roasts his own coffee, chats with customers and picks out furniture that he admits resembles a mismatched living room set. As simple as the coffeehouse is, Simsch says his place is genuine. "It's an artificially created experience," Simsch says of Starbucks version of the personal coffee experience. "A Disneyland with a nice façade. I love that they want to learn but on the other hand its like how do you learn to be a Buddhist monk? Its a way of life -- you can't."